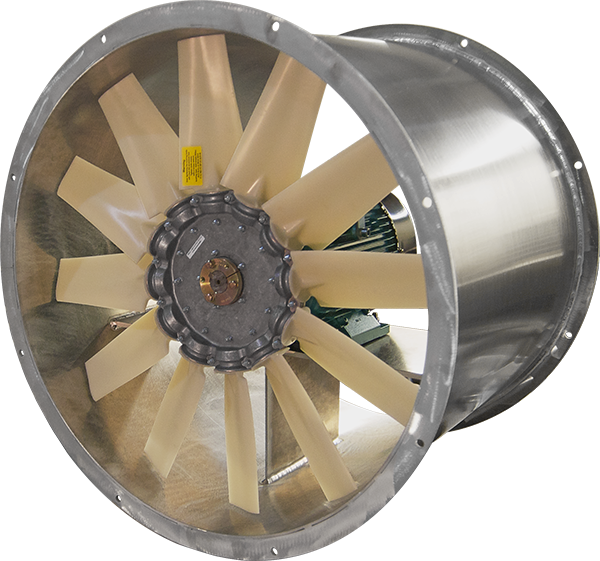 Our axial fans are designed for high performance and superior durability. We offer several unique series of fans, all highly configurable to meet your needs. Fans are available in diameters of 12 to 84 inches. FSB – This series features a highly efficient standard airfoil blade design, which provides low power consumption and low noise. The FSB series excels at moving high volumes of air with a relatively low sound signature. FSBH – This series uses a true airfoil blade with a longer chord length than our FSB series. This raises static pressure, allowing FSBH series fans to maintain high performance at lower rotational speeds. Applications include: machinery cooling, radiators, oil coolers, and Tier IV emissions solutions. 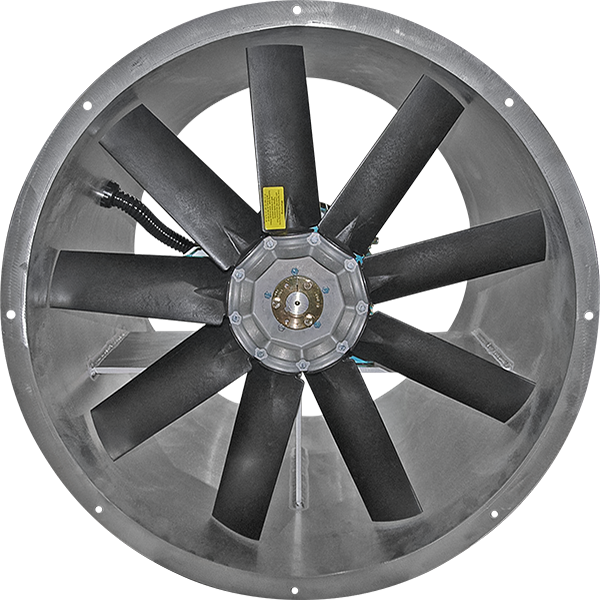 Zazz has utilized these fans extensively in OSV/PSV marine duty ventilation where high static pressures and long ducting are frequently needed. FQS – This series features a quiet sickle-blade design. The thin trailing edges generate very little turbulence, resulting in up to 7 dBA in noise reduction. The FQS series delivers high static pressure with a low sound signature. FFR – This series features a fully reversible true airfoil blade design, and is the only series that produces equally high airflow in forward and reverse rotation. 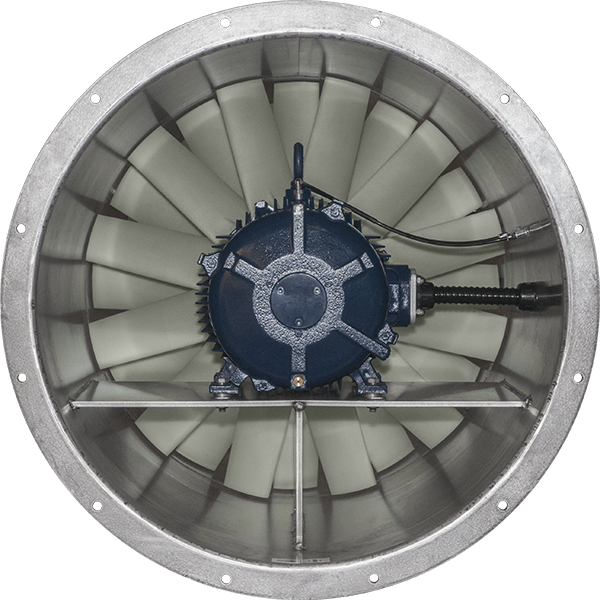 More cost-effective than variable pitch fans, FFR series fans are especially effective in applications where airflow needs to be reversed at a moment’s notice, while maintaining equal volume and static pressure. 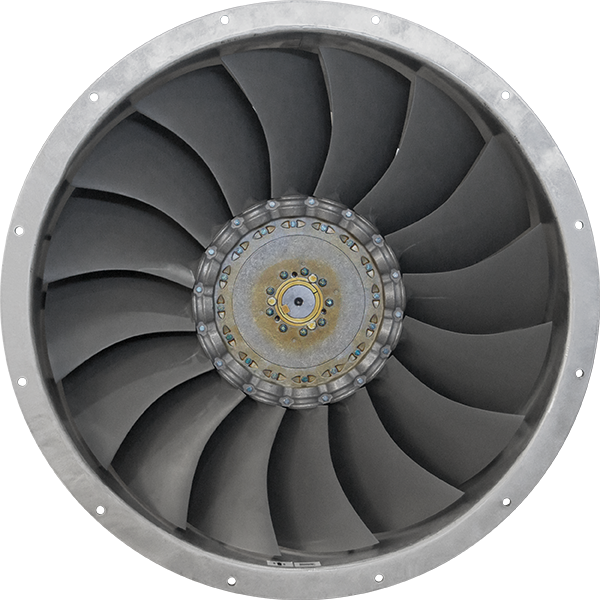 FCR – This series features two contra-rotating impellers, working in tandem to produce static pressures 2-3 times greater than that of a single fan. 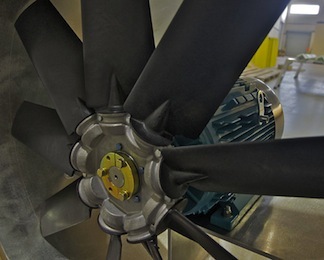 Unlike vane axial fans, this two-stage, redundant configuration also complies with classifications requiring a back-up in case of a motor failure. This series is ideal for applications where very high static pressures are needed. Click here to download an example spec sheet. 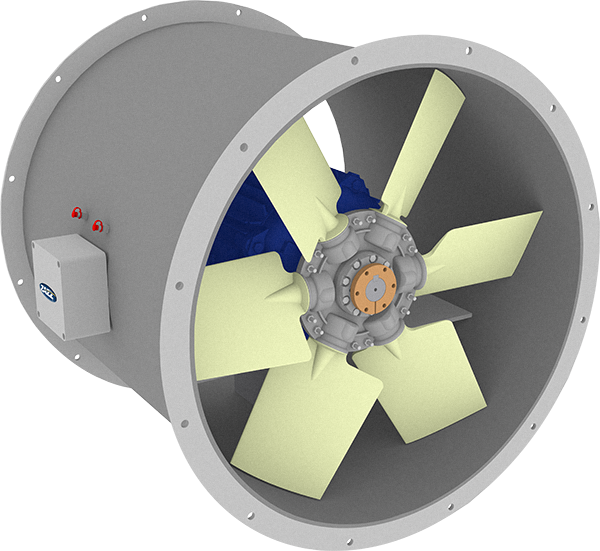 • Fan housings are constructed of welded marine-grade 5052 aluminum alloy. • All hardware for mounting of motors and terminal boxes is 18-8 or 316 stainless steel. Threaded inserts are aircraft-grade stainless steel. • Where required, we offer motors that meet IEEE-45 and USCG CFR46 requirements. These motors are cast iron construction and epoxy-dipped, specifically for marine use. • We use a teflon-based anti-seize compound on all fastenings that may need to be removed for future maintenance. • Some motors up to 10 HP feature bearings lubricated for life. • All electrical connections are on the exterior of the housing, making all fans suitable for in-duct installations. • Motors requiring periodic lubrication have the grease fittings remote-mounted to the exterior of the fan housing, near the electrical junction box. This allows for a single point of connection and maintenance. • All fans are extensively tested and torque checked. After testing, any places where lubrication cannot be used (such as the bushing that locks the fan hub to the motor shaft) are exterior spray-coated with an anti-corrosion protectant.